I'll update this article tomorrow with a full recap. Just want to get something up quick so fans can comment if they'd like. Stars lose in an overtime shootout tonight to the Omaha Lancers by a score of 2-1. Click here to view the Pointstreak boxscore. I'm not one to complain about calls, but thanks to an unbelievably bad call on Jimmy DeVito in the second period, the Lancers were awarded a bogus 5 minute powerplay in which they scored the game-tying goal. Late in the second period, Jimmy DeVito ran into Lancers goaltender Alex Lyon behind the Omaha net. DeVito knocked Lyon down, and Lancers defenseman Ben Ostlie immediately dropped the gloves and went after DeVito. At the most, DeVito should have received a 2 minute minor for goalie interference and a 5 minute major for fighting. Ostlie should have received a 2 minute minor for instigating (since he initiated the fight), and a 5 minute major for fighting. Instead, the refs gave DeVito a 5 minute major for charging and a 5 minute major for fighting. Ostlie was only given a 5 minute major for fighting. I've seen some bad calls at the IceBox, but this one was pathetic. Stars killed 4:54 of the 5 minute major before the Lancers scored to tie the game up at 1-1. Omaha went on to win it in the shootout. A gift-wrapped 2 points for a Lancers team that put an anemic 16 shots on goal through three periods. Santa came early for Omaha. I'll be called a homer and a sore loser, and that's fine. DeVito's penalty should have been a minor, and not a major. It was a bad call that had a huge influence on how this game was played. With the loss, Lincoln sits at 30 points (14-7-2) and in third place in the Western Conference. Waterloo leads with 32 points and Sioux Falls has 31. 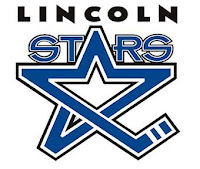 Just like last week, Lincoln held a significant shot advantage (32-19) on Omaha but the Lancers got back into the game via special teams.The Stars played without both captains Friday night. Mike McKee was serving a suspension and Dominik Shine is injured. Zach Aston-Reese was also out of the lineup due to a suspension. Jake Wood scored the only goal of the first period to get Lincoln on the board first. Wood's goal came 18:17 into the first period off of an assist from Paul Ladue. Lincoln outshot Omaha 8-4 in the opening period. Wood had an eventful first period in addition to putting his name on the scoresheet, picking up elbowing and roughing minors in the first five minutes. Neither team scored in the second period while Lincoln claimed an 8-7 advantage in shots. Things got chippy though. Zack Pittman picked up an unsportsmanlike conduct misconduct halfway through the period, and then the illogical call on DeVito happened with 4:01 left in the second period. Amazing call considering how Lincoln was treated last week in Omaha when a Star was checked low into the boards behind the net and required medical attention. Meanwhile Aston-Reese instigated a fight and got a penalty and suspension. On Friday, Ostlie instigates a fight on DeVito and receives no penalty and I'm sure will not get a suspension. The Lancers couldn't capitalize on the major in the second period, but they did 53 seconds into the third period. Just when it looked as if Lincoln was going to survive the bogus five-minute man disadvantage, with just six seconds left on the power play, Tucker Poolman evened the score at 1-1. Although Lincoln dominated the third period with an 11-5 shot advantage, and overtime with a 5-2 advantage, the game went to a shootout. The first two shooters missed for each team. Omaha's Jake Randolph beat Jackson Teichroeb in the third round, but Brent Wold scored to send the shootout into the sudden death rounds. Omaha's Alex Rauter scored and Eric Scheid couldn't convert for Lincoln, sending the Lancers to their second straight win over the Stars. Teichroeb made 17 saves on 18 shots. The Stars face the Sioux Falls Stampede on Saturday at the Ice Box. Sioux Falls will be well rested after not playing Friday night. The only thing consistent about Anderson's officiating, is how inconsistent he is. Something that wasn't a penalty in the first, is a penalty in the second. It's a little ridiculous. I'll admit that at times we appear undisciplined, and we're to blame for some of our penalty problems. But, I would be amazed if anyone from the USHL could watch that game and say it was evenly officiated with a straight face. I thought that Devito should have gotten 2 for the charge and that Ostlie should have gotten the instigator - especially after what happened to ZAR last weekend. The officiating in this league is generally horrible and there appears to be no accountability for making bad calls. Don't get me wrong, the officiating has really come off as incompetent this season. And is it me or is Lyon untouchable out there? I'm a goalie fan, but IMHO keep playing the puck out there like that for that long and you're fair game for contact. I swear each time he draws an interference (or worse). BUT and this may get me in some hot water, but coach Johnson echoed what I'd been thinking to myself: Lincoln needs to score more dirty goals. I had always suspected that I've SEEN more goals this year compared to last when one would see a scrap in front of the net and you just waited for the red light. Even with Roy...maybe especially with Roy. I'd just like to see Lincoln battle up front. To parallel some of what we say with Husker FB games this year: don't put yourself in a position to let bad calls decide games. This is a good team that maybe suffered from the curse of the fast start. They'll find their way. Maybe I'm way off but thanks for the space. 100% agree with you, Jason. Thanks for the post. Lincoln did have a few open net shots that missed, so if they score there that would have negated the PP goal Omaha scored in the third period to tie the game. I definitely agree that this year's team seems to me more timid when getting into those areas in front of the net to score dirty goals. That will have to change if the Stars want to play postseason hockey. And even though I didn't like the major call on DeVito, the Stars still need to play more disciplined. I'm not sure if that's coaching, or what. But the undisciplined penalties are killing this team.